I’ve been making felt flowers for a couple of years now and decided to make my own succulents .Felt is my favorite medium to use. It doesn’t fray and comes in all colors.You can complete this project in an afternoon and once you’re done, just place your succulents in a shallow container or small planter with some moss and pebbles and you’re good to go, no green thumb required ! Start with the largest size petals. Overlap the petals slightly and glue them in place. Repeat until the first layer is complete. Keep adding layers by repeating this step. For the center, roll the remaining smallest size petal into a bud and stick it in the center of the flower. You can just make a single succulent and display it in your favorite mug or cup and give it to your friend or co-worker . 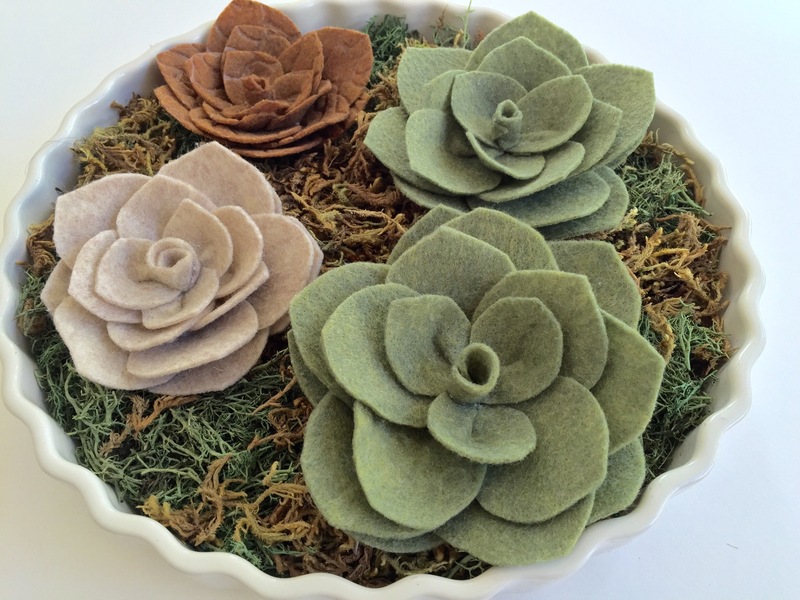 Or you can make several in different colors and sizes and make a miniature succulent garden.